Merri Creek Management Committee has been awarded a $17,905 Community Grant from Melbourne Water to diversify habitat structure and promote bird habitat in the vicinity of Phillips Reserve and Kirkdale Park, Brunswick East. 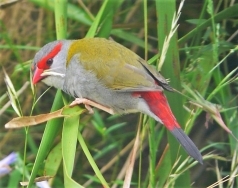 There are many gorgeous birds that feed, play and nest along this stretch of the creek including sociable Red-Browed Firetail Finches (photo) which require habitat with a dense understorey. 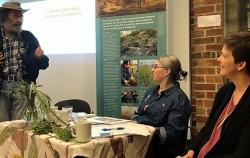 The grant will fund the planting of 700 understorey plants and shrubs across the sites with the help of the community, as well as weed control in the preliminary stages and whilst the plants are establishing. You can help with the planting on 14 July at Phillips Reserve, Brunswick East. Subscribe to our events notification emails for details of this and other events. Would you like to do something about the litter that gathers along the Edgars and Merri Creeks after rainfall? In 2018, twenty-nine volunteer cleanup events were held (that we know of) with 350 people contributing to this massive effort. In 2019 we are hoping for even more. Friends of Merri Creek encourages community litter cleanups on creeks in the Merri catchment, but wants to make sure that this is done safely. 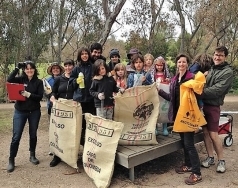 See Friends of Merri Creek community litter collections page. The Friends also need your help to collect information on the type and amount of litter entering the creeks, with the aim of tracing it to its source and planning to prevent further litter from reaching the creeks. 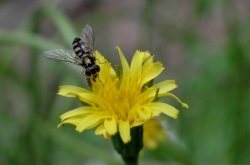 Volunteers have been hard at work raising rare plants as part of the Friends of Merri Creek’s three-year Secret Seven seeds project, which aims to increase the seed supply of seven rare Merri Creek plant species. Northcote resident Jane Mullett has successfully raised Plains Yam Daisies to the seeding stage. She says "I am getting heaps of seeds off them. I am harvesting between 3-5 puffballs every second day!". The plants were initially grown by VINC. This project is funded with the support of the Victorian Government. The Friends of Merri Creek have contracted MCMC to help deliver the project.